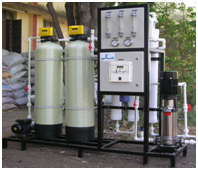 Reverse osmosis plants are quite exclusively constructed by installing spiral wound membranes. 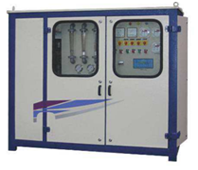 They work with medium- high pressure depending on the type of application (6 - 80 bar) and they are applied to separate the dissolved salts from aqueous solutions by means of semi-permeable membranes. In this case the dimension of membrane pores are very small so that the resistance to the passage of water is higher. The technology and process involved are relatively simple, membranes representing very fine filters, which act like sieves through which water is either pressed or sucked. Any content, which is larger than the microscopic pores, is separated out and depending on the ineness of the filter, a differentiation is made between micro filtration, ultra filtration, and nano filtration. Reverse osmosis is an additional variation, in which only water molecules pass through the membrane.